We are glad to see your interest in Aaron's Reliable Moving & Packing Company. As a family owned and operated Local & Long Distance moving company in Chicago we pride ourselves in being the BEST full-service residential and commercial movers in Chicago. We have earned a Perfect A+ rating with the Better Business Bureau by satisfying thousands of individuals, families and businesses in Chicago and across the country. 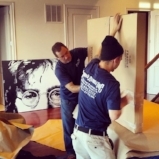 Unlike most of the moving companies in Chicago, Aaron's Reliable Movers is highly specialized in every aspect of the moving process, from packing and moving to unpacking and installing entire art collections.